Phil came to diving from a background of speleology (Dry caving) that lead him into various disciplines such as rope work, climbing and eventually diving. Learning to dive with Steve Axtell, a highly regarded PADI Course Director, Phil soon found a passion in diving to match his love of caving and followed the PADI system with Steve up to passing his IE in February 1991 and then working for Steve's company 'Diving Leisure' for 8 years as a full time PADI Instructor for 8 years working his way up to Master Instructor. During his time as a full time recreational Instructor Phil started to broaden his own skill set with Mixed gas, Technical, Cave and rebreather training through IANTD with Kevin Gurr. and Dave Thompson. This training aimed at giving the skills needed to explore caves taking him back to his caving roots also developed a love of wreck diving. 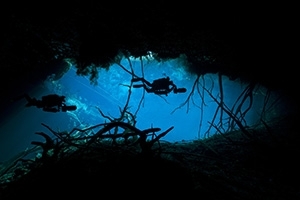 At this time Phil qualified as a diving member of the British Cave Diving Group (CDG). Phil was part of the first UK deep wreck team 'DEEP' with fellow members including Kevin Gurr, Dave Thompson and Allan Yeend. 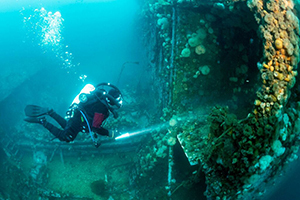 The team completed many first dives and positive identifications on wrecks in the English channel in the 50-80 metre range in the mid 1990's. Phil moved away from recreational Instruction to full time Technical Instruction through IANTD and began working for Kevin Gurr at Phoenix Oceaneering in 2000. Through working with Kevin Gurr at Phoenix Phil was able to be a team diver on many projects including TV documentaries for the BBC on the M1 submarine and for Chanel 4 on the Battle of Jutland and Historic shipwreck projects in the Gulf of Mexico and Guam. During his years with Phoenix Phil continued to run his own projects in caves mainly with his long term Cave 'buddy' Gavin Newman, an Emmy winning cameraman, such as the 'Hidden River' project in Mallorca and the BBC Documentary covered project 'The Road to Certain Death' in northern Spain. To meet the demands of theses logistically complicated projects Phil moved over from Open Circuit to Closed Circuit equipment in the early 2000’s starting on a MK 15.5 CCR on the Guam Historic shipwreck project, then becoming the test diver and principle IT for the Ouroboros CCR followed by the Sentinel CCR. Phil finally got the opportunity to combine his knowledge and experience of Dry Caving, Cave Diving and CCR as a lead exploration diver on the United States Deep Cave Diving team J2 cave project under the leadership of Bill Stone that saw Phil and Marcin Gala pass the 4th sump in the J2 cave to discover dry cave beyond at over 1 kilometre vertical and 12 kilometres horizontal from the entrance. The project utilised Poseidon MK 6 CCR and saw Phil spend 45 days underground during the 3 month project. Prior to a year spent working for Dive Tech in Grand Cayman Phil spent time with SubGravity in Utah training on the Hammerhead CCR and became one of 5 world wide IT’s for the SubGravity range of CCR, later upgrading to IT on Defender CCR and X-CCR when the SubGravity Platform changed control system. During his year in Grand Cayman along with his wife Gemma Smith he conducted a 155 meter camera housing functionality test dive for Nauticam and taught and Technical guided using his Hammerhead CCR. Phil was awarded 'Diver of The Conference' award at the 'Tek Dive USA’ conference 2016. Over a 25 year professional dive industry career Phil has logged over 6000 dives and 3500 plus hours on CCR and now dives a Sub Gravity Defender CCR, JJ-CCR and VMS Red Head CCR dependent on the project he is working on. Phil and his wife Gemma Smith formed their own company Dark Water Exploration at the start of 2016 and now primarily serve the Scientific and Media Diving communities as project logisticians, rigging and guardian divers and Phil’s speciality being project DSO (Diving Safety Officer). 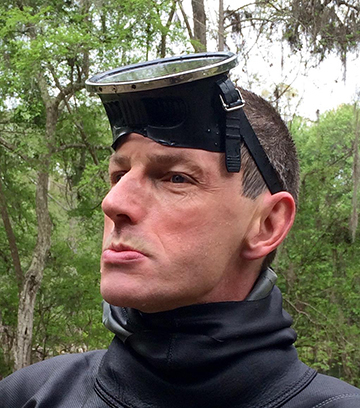 As such Phil has trained, supervised and run projects for the US National Parks Service, WHOI, The UK Police Diving teams, the Greek Ephorate of Antiquities, Lund University and the US DPAA among others. 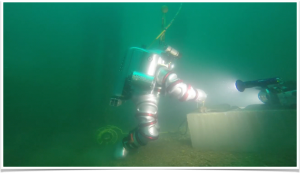 TEKDiveUSA.2016 Back to The Future: Tech Diving in 2026?